After my successful trip to Loop I skipped my way over to ReThreads. I was headed there with a mission. I’m doing a 50’s and 60’s musical review. It’s a great show, but we ran into one little problem with costuming. The 4 girls wear 50s/60s coctail dresses for many numbers. 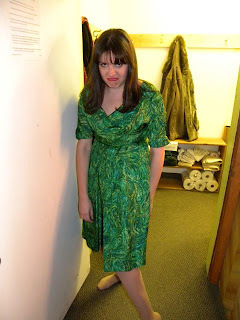 When we started I had a beautiful vintage green dress. It looked lovely with the Pink, Yell, and Blue dresses the other girls were wearing. Unfortunately as we got closer to opening the show, the seams started to literally melt away. Even in places were the dress was not tight at all, the thread was falling apart. It was just too old, too well loved. It would have taken forever for the stitches to be replaced, so a new dress needed to be found. The bummer was, it was too late to run around to vintage clothing stores and find a perfect fit (especially when I don’t have the darn 26 inch waist most of these 1950’s girdled women seem to have). So, something had to be pulled from stock. I totally understand why this happened, but the result was a bummer. I ended up in a frumpy patterned dress which looked silly compared to the other girls. I didn’t say anything, I wore the dress and did my job. BUT after hearing how BAD I looked on stage from not 1, not 2, not 3, but 4 times by 4 SEPARATE PEOPLE! I new something had to be done. And thus… MY MISSION BEGAN. After heading to 4 different vintage clothing stores and leaving empty handed I found the home run dress at ReThreads in Milwaukee! I could not believe how perfectly it fit. It had long sleeves which was a little weird… but Aja Heuss (our ASM) removed the sleeves and placed the cuff buttons on the shoulders! I am now soo excited to put on this costume. Yahoo!!! Success! Here’s the 4 dresses together : ) Yay! Thank you Milwaukee!